How do I know when and where to catch Metro? Please see Maps and Schedules, or call Metro Customer Service at 341- 0800 (v) / 341-0807 (TDD). Are Metro buses wheelchair accessible? Wheelchair accessible service is available all day seven days a week. Every bus has either a lift or ramp. Each bus has seating for two wheelchairs. In addition, many of the buses can kneel – the front door side of the bus lowers for easier access. Kneeling buses are designated with a decal on the right front, rear of the front door or both. Wheelchair and kneeling features are available for general public use, e.g., elderly, wheelchair users, persons with other mobility impairments, passengers traveling with such things as baby strollers, pull grocery carts, etc. 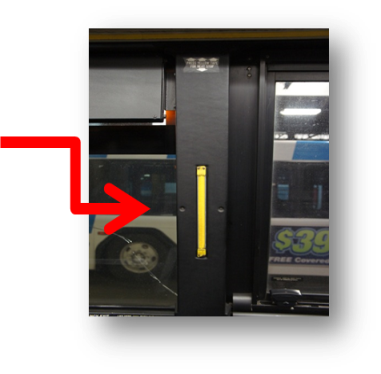 If you want to use lift/ramp or have the bus kneel, please ask the bus driver when the front door opens. The driver will be happy to activate these features for you. 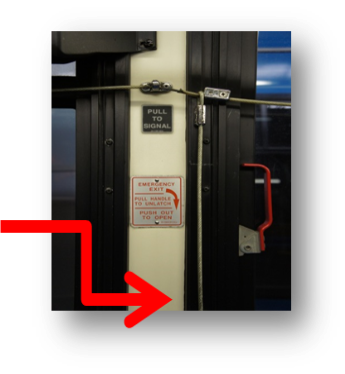 Priority seating for elderly or handicapped persons is located in the front of the bus and designated by a decal posted in the windows directly adjacent to the seats. If these seats are occupied, most passengers are willing to move when asked. If a disability prevents you from traveling on a bus, Metro operates MOBY, an ADA certified complementary paratransit origin-to-destination service. Here is information on MOBY, and here is the ADA application form. How do I know I am boarding the correct bus? The destination and route number are displayed on digital signs located above the windshield and to the left of the front door. Newer buses have the route number on the rear. If the route number on the bus matches the number printed on your schedule, hail your bus! 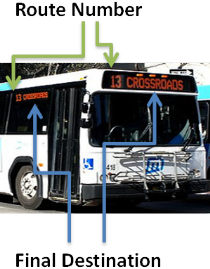 For persons with difficulty knowing where the bus is on the route, when you board please ask the bus driver to stop at a particular bus stop. It is advisable to sit in the priority seats located directly behind the bus driver. Keep in mind the drivers are busy and while they are there to assist our passengers, traffic/weather conditions and other passenger activities may cause them to miss stopping at your specific stop. How much does it cost to ride Metro? Please see Fares & Passes. Where does the fare go? The top accepts / activates fare cards and value cards. Passes, once activated, must be swiped in the magnetic swipe slot. If a fare is rejected, farebox “warbles”. Passenger must pay fare with either cash or a different card. When paying with coins, please only insert one coin at a time. 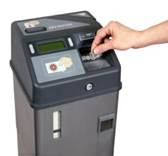 Metro urges passengers to use exact cash for fares, but the farebox will provide value cards for any cash over payments, which can be used as future fare credit or can be combined with additional cash to make up the difference in the required fare. Value cards are valid for 90 days after issuance, and are not redeemable for cash. Operators are not allowed to make change or handle money. Do I pay to transfer? Yes, a transfer costs twenty-five cents (25¢). For further details, please see Transfers. How do I signal the bus driver I want to get off? Remain seated until the bus is stopped. The driver will open the rear door for exiting. Once off the bus, never, never cross in front of the bus. -Step to the curb and wait for the bus to depart. -Stop and look for traffic if crossing a street.